Since yesterday's cupcakes were a lighter indulgence, today's indulgence is a bit more decadent. Since I bought them at the farmer's market a couple weeks ago, I have been craving these Dark Chocolate Strawberry Mochi. A huge ripe, strawberry, covered in dark chocolate and covered in mochi. If you are not familiar with mochi, it is basically glutinous rice pounded into a paste and molded into different shapes. This mochi dessert is a "daifuku" style, meaning it is a soft mochi ball that is stuffed with a filling. The very best ones are from Two ladies Kitchen in Hilo,on The Big Island, but these from the Saturday's Grandma Line at Made in Hawaii Foods are pretty darn good. You have to get to the booth early though--the plain strawberry and these with chocolate sell out early. I want more and at least I am getting fruit and the antioxidants from the dark chocolate! 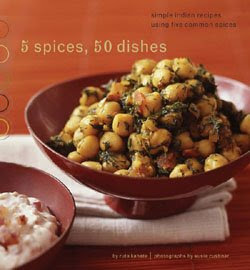 Now, on to the winner of Giveaway #1, one of my favorite cookbooks, 5 Spices, 50 Dishes. It was fun to see what 5 favorite spices you all picked and it made me realize it is impossible to settle on just 5. One of these days, I should to learn how to do a random number generator, but there is something satisfying about writing each name on a slip of paper and drawing out one slip. L.K. from Healthy. Delicious.! Congratulations L.K.! I know you will make good use of the great recipes in this book. Shoot me an email with your mailing address and I will get the book out to you. Disappointed you didn't win? There are still 2 giveaways to go so don't forget to check back Saturday for the details on Giveaway #2! Loved the Chocolate Strawberry Mochi. Your photos are gorgeous. I have never had mochi.. or even seen it - how wild! Congrats L.K.! Dinner at your place? Those mochi look fabulous. I have that cookbook too, in fact, I'm making the masala omelets and coriander crusted potatoes for dinner tonight! I love mochi, and I never even knew this combo existed. When I go home for a visit, I think I will become obsessed with finding these! Saturday Grandma's mochi is also available at Made In Hawaii in Pearl City, though you need to order ahead. I also like their lilikoi cheesecake mochi, yum! The book you gave away is also one of my favorite books. I was at a press dinner/cooking class for the book launch in the bay area. The food writers at the launch all had to team up and cook several dishes. The green beef is to die for and the eggplants stuffed with peanuts are awesome. I have made many things in that book! I found your blog through Coconut Girl (Connie's)Blog. The Mochi looks delish - wish I could get those here in Texas! wahoo! thanks! I'll email you my mailing info. that mochi looks awesome with the strawberry. I wish i could find something like that here.